Pinterest Traffic: Does Pinning Frequency Affect Traffic? That’s the Million Dollar Question, right? Problem is that, like most things, it’s subjective. Growth on one account (like your friend’s account or another blogger’s), may not be a good indicator of growth on your account. How many times per day do you pin? How often are you creating new content? Does each piece of content have a Pinterest image? Is the Pinterest image interesting, clickable, and described well? Do you pin to just your own boards or group boards as well? How many boards are on your Pinterest account? Do you have an active reader base that loves and shares your content? After working with over 65 accounts I can tell you that each account has its own culture and grows differently. All the factors above play a role in growth. Let’s start this series by discussing in this post: How many times should you be pinning daily? I’ll start with this right off the bat — I’m not a subscriber to the “over 30 pins per day” philosophy. 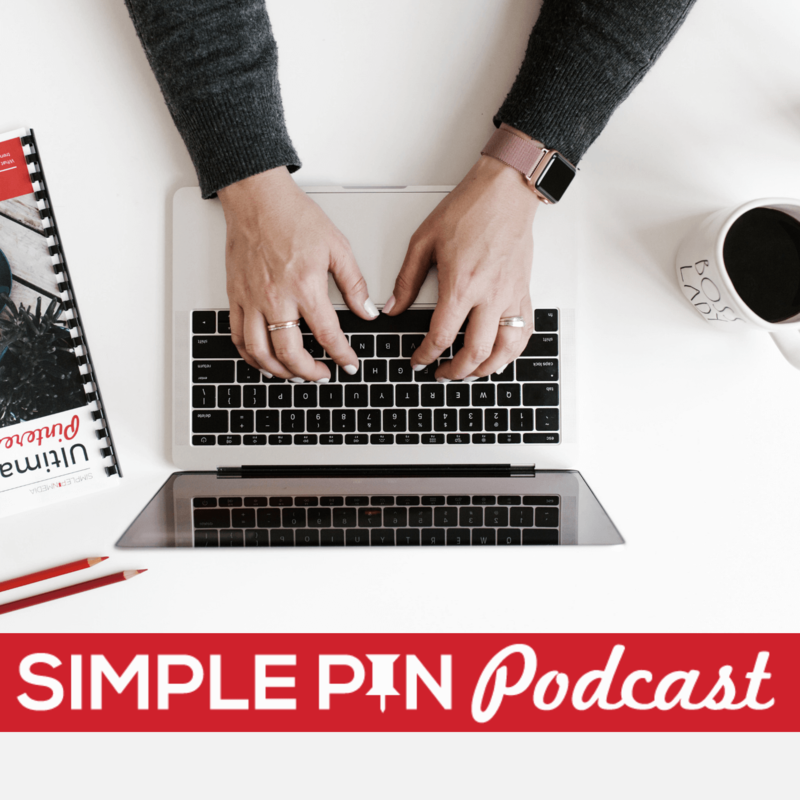 At Simple Pin we have three packages — 10, 20 and 25/30 pins per day. I simply do not see the benefits of pinning much more than 30 pins a day. I believe your time is better spent working on new content and revising old content to appear fresh on Pinterest. For today’s post, I am pulling the analytics from eight accounts that pay for us to pin 10-20 pins per day. (We didn’t have enough data collected yet for the 25/30 range.) The information listed here ranges from August – December 2015. Follower growth is broken down into the percentage of growth over six months, not monthly. *Does a bit of pinning on her own, about 5 per hit or miss. Page Views Increased by 721% over six months <— This blows my mind! Look how many followers they have! The assumption is that the bigger you are the faster you grow. The fitness blogger with a small number of followers gained more page views faster than the account with over 40k. The food blogger had an increase in page views around Thanksgiving/Christmas and the fashion blogger increased in the fall. The frugal account decreased in page views at Christmas time which is usually when most frugal/deal accounts gain traffic. Every account had a decrease in page views at some point in the last six months except the fitness blogger, which still blows me away. The frugal account has been on Pinterest within 6 months of the platform starting. Their page views have slowed despite creating fantastic images and curating good content. However, readership has slowed down over the same period of time. Could be a connection? Both Healthy Living lifestyle blogs increased in page views. Both have fantastic content and great images. The mom/fashion blogger has been rocking the page views all year long with a recent increase to 30 pins in September. That did create a spike in traffic with views then leveling off. Here are a few things we can confidentially say about the number of pins per day question, now that my eyes are crossed from all this data. My initial thought was the same as most people — more is always better. More pins will get you more traffic. I was expecting the 10 pins per day group to increase their page views by 10% per month, similar to Food Blogger A. However, the other two accounts pushing out 10 pins per day increased their page views by 5-10% over the same six month period. And the fitness blogger/seller! Increase of over 700%. That’s crazy. When I looked at the 20 pins per day group, I initially assumed they would all experience growth somewhere around 10%. However, the percentage of page view increases varied from a decrease of 15% to and increase of 144% and follower numbers vary within 10k of all the accounts. This tells me that pinning more often isn’t always the answer to every Pinterest problem. In order for you to evaluate growth on your account, you have to look at more than just how many pins per day. However, if you want to keep pinning 50-80 pins per day, that’s awesome! Keep doing what you’re doing if it’s working for you. Regardless of the numbers of pins per day, make sure you’re pinning pins that are useful and pretty. One amazing pin is better than 10 blah pins. Pin the best and you’ll be rewarded. Next hop over and read how scheduling tools affect the growth of your Pinterest account. When you’re finished with that one, make sure you check out our study on branded images. Do they make a difference in growth over those who don’t create branded images? Interesting! Thanks for pulling this info together. I have seen a big dip in my traffic from Pinterest since October, all while adding followers. I have been pinning about 20 pins per day via Tailwind, but I think based on this info I’m going to pull back to 10 (maybe I am overfilling my feed?) and see how that goes for a month. I really enjoyed your podcast with Food Blogger Pro and have implemented some of your tips for reducing and focusing my boards. Thanks! 20 is still a good number. I would focus more on pinning the best of the best. What content is already getting good traffic? Move with that momentum and Pinterest will reward you for pinning more of what people already love. Thanks for listening to the podcast and good job implementing tips. Touch base in a few months and let me know how you’re progressing! Thank Steph! Excited to have you following along. Great article! Really helpful to see real data! One quick question: are the Page Views numbers JUST Pinterest traffic to these sites, or are they overall traffic numbers to the sites? I assume it’s just Pinterest traffic but wanted to check before making any assumptions! Thanks again for the great article! Thanks for the quick response! By the way, do you know of any other good case studies or hard data (from other blogs/reports or yours!) on how much traffic individual sites are getting from Pinterest? In particular, we’re looking for examples of what kind of traffic ranges smaller sites just starting off on Pinterest can get. I know this varies a huge amount, but it’s hard to decide if we should invest the time in Pinterest if our payback is a huge unknown! It does vary a ton. In the first 3 months it’s reasonable to expect around 500-1000k page views per month depending on how often you’re pinning (10-20 pins per day). This also depends on how much Pinterest content you’re creating that will help pull in traffic. When thinking about investing it’s best to look at who your ideal customer/reader is. Are they on Pinterst? If they are, it’s worth investing the time and money into building a page with at least 10-20 boards and pinning daily between 10-20 pins. You’ll start to see some small growth within a month. Thanks! Looks like a small typo, you mean 500-1k PVs/mo after 3 months, not 500k – 1000k PV/mo right? So would it be fair to estimate if you spend between 10-20 minutes a day every day on pinning, you could get to something like 500-1,000 PV/mo after 2-3 months? (or 0-500 PV/mo after 1 month of daily work)? Yes, typo! 500-1000k. It is slow and steady but having started a few pages from scratch they all have run that range in the first 3 months. Some make a slow start and then jump, other’s jump right away. It’s also key to get on some group boards that display your pins to more people. This will definitely help with click-thrus. Hi, I was wondering if you might help me with a question? I love your pinterest articles! I am just wondering, I am about to re-organise my pinterest and my pinning schedule. Would you recommend to focus those 10-20 pins on a handful of boards or just spread them out over all of your boards? Currently, I have 40 boards but I find them a bit unorganized. So I want to re-organise them and break some boards up etc. Which will give me 70 boards. For example I do weekly meal plans oriented towards families, busy mums etc. So instead of my Dinner ideas board, I want to separate it into chicken recipes, beef recipes, vegetarian etc. I am just not sure if a) that is too many boards and I should just expect people to search within boards and b) if I should be doing most of my pinning to just a handful of boards so 70 is way too much. I hope you don’t mind me asking about this! First, I would spread them out amongst all boards. This keeps the account active and engaging for your followers with fresh content. Thanks so much for the reply! I had been going around in circles trying to decide what I wanted to do 🙂 It helps to get advice from someone who actually knows what they are doing! Thanks again. Kate, it would be very interesting to get an update on this post about pin frequency with the results for those same client accounts, now that you have a full year of data for these accounts! I’ve got a plan for that! Thanks for the reminder. I must say you did an awesome work on the analysis! I have around 40 boards on my Business Pinterest profile (it’s verified with my blog), from which only 6 are mine, and the rest are group boards. My question is: When i have a new article, am I allowed to pin it to all the boards that i’m in? Is that considered as spam? 1. If so, is there a maximum number of boards I’m allowed to pin the same article? 2. If so, does that mean that I only have 1 shot (1 board) to spread my pin? The questions might be stupid, but i’d really appreciate if you can answer them. Second, you can pin to all of them but that does look spammy. I do 2 per day and the same amount subsequent days. Not only one shot but you can keep going throughout the month. Thanks for this post, it’s very useful, as well s the comments! I also have a couple of questions – I’ve seen a lot of bloggers talking about repining their old content to keep it fresh. What is the proper etiquette with this? 1. Do they mean pins from their website or also repins from others? 2. How often should I do this without appearing spammy? 3. After repining, do I delete the old pin or keep it? Also, is it advisable to pin your own pins to multiple boards? I have a “best of” but I’d also like to pin it to my other relevant boards, is it okay to do that if I space them out a bit? 1. you can pin from either your site or Pinterest. 2. I would aim to pin your most popular pins at least 2x per week. Absolutely! Pin your pins to multiple boards while pinning other people’s content to keep it from looking spammy. I am so glad Pinterest took me to your post! Your tips will help me a lot. I have been struggling with growing my traffic using Pinterest and what I just found here is a gold mine. My question is if I have 3 boards do I pin 10 times a day to each one or just divide the 10 (or 20) by the three boards. This is such a helpful post! I used to pin 60 times per day and it was not doing me any favours. I went down to 30 times per day and my traffic quadrupled almost instantly. I am thinking of scaling back even further now and pinning only my best content and seeing what happens. Loved the research you incorporated in your post! It was very helpful! Isn’t it amazing what can happen when you tweak up your number of pins per day?! Glad it was super helpful. I’m confused by one thing though. Those bloggers who post 1 article a week but pin 20 pins a day… what are they pinning? They’re not creating 140 different covers for their post, are they? If what they’re doing mostly is repinning, how does that create generate page views? If someone clicks on those pins they’ll go to someone else’s website, won’t they? Nope — you can pin the same pin over and over with different pins inbetween so it doesn’t look like spam. Hop over to my pinterest account to get an illustration. I only create one article per week but they are pinned to different boards.